In my last published post I had just begun to work on a Tabernacle Frame, an exciting project to say the least. If you recall, the plan was to first make the spandrel (gold leafed panel that surrounds the painting) and build the frame around it — that’s exactly the process followed. I often get questions about how I determine the sizes and spacings of wood in a project like this and there are a number of methods used, notably is the Golden Ratio. What I tend to do is to trust my eye first and often, when I check my drawing against the Golden Ratio it matches pretty closely! Another method you don’t hear about too often is basing project sizes off of the material you have available. 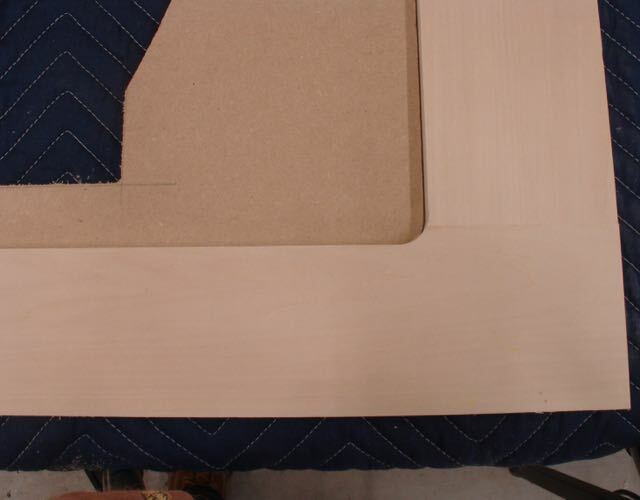 For example, to determine how wide to make the sides of the frame a piece of wide Basswood was evenly cut in half — voila; that’s the width! It was drawn to scale before actually cutting but I’m sure I’m not the only woodworker that bases the size of project parts on the material available. Constructing the frame starts by milling the material, for me a combination of hand and power tools like this scrub plane, table saw, power planer, and jointer plane. You’ll find the term hybrid woodworking used to describe this method — often I’ll say the power tools are my apprentices and then I use the hand tools refine that process. Since the horizontal pieces are 5″+ a 1/2″ deep mortise was cut the entire length with a 1″ deep by 2″ long tenon. This is to prevent the piece from wracking. Again, the hollow chisel mortiser and table saw starts the work and then the tenons are sized to fit with hand tools. On the mortiser I’ll use a 1/2″ gauge block to set the depth for the haunch then remove it for the tenon (see picture below). Once satisfied with the joinery it’s time for glue up and at over 3′ wide I needed to get creative with clamping. By clamping a 6′ bar clamp to the assembly table I was able to pull it off! Now that the frame is assembled it’s time to add the elements. One thing that needed to be done was to rabbet out the back to fit the spandrel. This was done with a 3/8″ rabbeting bit in the router, decided it would be easer to radius the spandrel than to square the corners! The 2″ wide columns were created with a single bead router bit. The crown and dentil molding was purchased from Barger Molding. I thought I’d need to make the small cove located below the bottom horizontal piece but found a piece of molding that had it there and ripped it off, only about a 3/8″ cove. The top and horizontal piece at the bottom were glued, screwed, and plugged. Wanted to be sure they were as secure as possible since those areas might be used as “handles”! The rest was glued and attached with 23 gauge pins — they say they’re almost invisible but I disagree, a test piece shows them so they were all covered with Bondo surfacing putty and sanded, yes I’m particular! In the test piece the pins at the top were puttied, bottom left alone. Here are some pictures of the final assembly steps. Where the dentil and column came together it needed to be scribed and then pared level with the column. Decided to use plugged screws and glue to attach the top piece as well as the bottom shelf thinking that they may be used for “handles”! Ready now for the finish process, always one that gives me some concern. Made a practice piece to experiment with so I can get the patina and aging process just right. I'm a retired woodshop teacher. I build one of a kind furniture pieces and custom picture frames. You can see some of my sell and carvings through my Etsy store: https://www.etsy.com/shop/WoodworksbyJohn?ref=si_shop Contact me about your project -- always up for the challenge of unique work. This entry was posted in Design Process, Hand Planes, Hand Tool Woodworking, Hybrid Woodworking, Mortise and Tenon Joint, Picture Frames, Tabernacle, tabernacle picture frame and tagged 23gauge pins, Bondo for picture frame, crown molding, custom picture frame, dentil molding, haunched tenon, hollow chisel mortiser, quarter round molding, rabbet, spandrel, tabernacle picture frame. Bookmark the permalink.